A medium-sized feline, Jungle Cat is believed to be the largest of the existing Felis genus wild cats. Distributed over a wide area extending from North Africa to Southeast Asia, the Jungle Cat is one of the most adaptable and versatile cats. 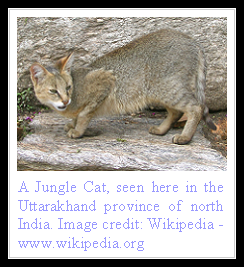 Contrary to what its name suggests, the Jungle Cat is seldom seen in dense tropical rain forests - existing more on forest and river margins and marshy areas. A large, slender cat it resembles a Serval in its physique with a weight ranging from ten to thirty five pounds, height at shoulders around fourteen inches and length nearing two and a half to three feet - though considerably bigger Jungle Cats have been recorded in the wild. Color is uniform and quite similar to the domestic Abyssinian cats, varying across the cat's distribution, from a sandy gray to reddish. Legs are long and are often marked by some brown stripes. Tail is short, black-tipped and often ringed. Nose and chin are usually white and ears are large with dark tufts on the top like those of a lynx - giving rise to their common name 'Swamp Lynx'. Felis Chaus, the Jungle Cat seems to have been bred of its ancestor African wild cat in ancient Egypt for the purpose of hunting wild fowl - afterwards it was mummified and entombed there. Primarily a predator of small mammals, fish, birds, rodents and snakes - the cat has been known to take down deer fawns and wild pigs. Hunting mostly in daytime, Jungle Cat has been known to swim and attack aquatic animals. Often seen in groups, the Jungle Cat is perhaps the only feline where both male and female come together to actively partake in the rearing of the young. Kittens are born after a gestational period of around sixty five days with a large litter of up to six babies often recorded. They have a number of stripes to camouflage them in their infancy that disappear as they age. Males, the larger of the species, are even more protective of the young than the females and emit loud barking sounds as part of their vocalization. The kittens are weaned off at three months and begin hunting at six months. Independence is reached at ten months and sexual maturity is gained at around eighteen months of age. Mating is believed to occur twice an year. Despite having a large distribution in the wild, the Jungle Cat, also known as Reed Cat, is now being considered to be under threat owing to widespread hunting for its fur. It is estimated that as many as twelve adult jungle cats are killed to make one fur coat. It also comes in conflict with farmers over occasional consumption of domestic poultry. Many sport hunters don't hesitate to poison this beautiful cat since it preys upon the small mammals they like to hunt! 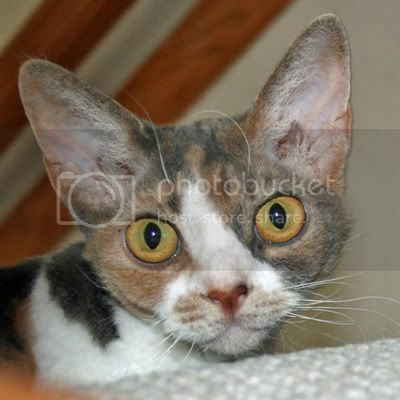 Before I even read your second paragraph I was thinking that the coloring was just like an Abyssinian! What a pretty cat. ben: uncle omer, please forgive lucy, she's a little feisty these days. she's been sleeping under the christmas tree and is INFECTED with holiday spirit. could you recommend an antibiotic? maybe an anti luciotic? mol get it? lucy-otic? I'm with Daisy and Mickey. We were thinking abbys and Ramses! I JUST PURCHASE TWO JUNGLE KITTEN. I AM IN LOVE VERY KIND AND WELLMANNERD. I FEED THEM RAW MEATS AND CALCIUM POWDER ON TOP. JUST HAVING THE BEST TIME WITH MY BABIES. Our website is No. 1 in C/ C Assignment Help and C/C++ Project Help. You can also hire us for C++ Projects Assistance. CHelpOnline.com is the Number 1 C/C++ Help Site in C Assignment Help niche. Jungle cat is little different from the domestic cat. But the common activities and behavior is little same.